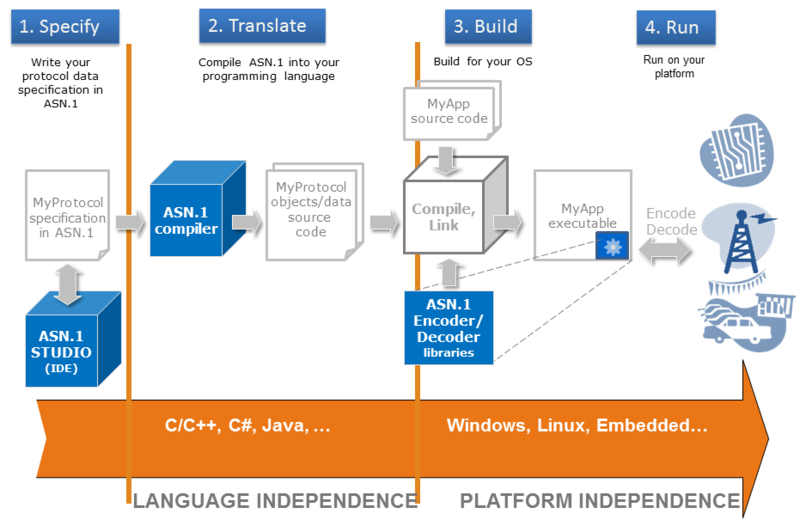 Do you have a sample application that illustrates step-by-step the use of the OSS ASN.1 Compiler to compile a simple ASN.1 module, and the use of the OSS API to invoke the encoder/decoder? The following sample application illustrates the use of the OSS ASN.1 Compiler to compile a simple ASN.1 module, and the use of the OSS API to invoke the encoder/decoder. By following these steps you can produce and run an executable program that encodes and then decodes a message. The C application program in this example is tbcas.c and the associated ASN.1 source file is bcas.asn . Both of these files can be found in the SAMPLES subdirectory of the OSS ASN.1 Tools shipment. The OSS command line syntax allows the compiler-generated filenames to be selectively overridden. In this example, we let the names default, yielding file names bcas.c, and bcas.h. When compiling the ASN.1 specifications for use with the SOED (Space Optimized Encoder Decoder), the .c file contains OSS internals information and is not shown here. After the application program is compiled, the OSS Encoder/Decoder object library must be linked into the resulting executable file. The above command C-compiles the compiler-generated .cfile ( bcas.c ) and the sample application program (tbcas.c) , and links them with the space-optimized encoder/decoder and the default memory manager (all contained in libasn1code.a ). The resulting executable file is tbcas.exe. This command simply runs tbcas. Note that debugging output is generated because the DEBUGPDU encoder/decoder flag was set before the encoder/decoder was called. Encoder/decoder debugging output, and completion message.